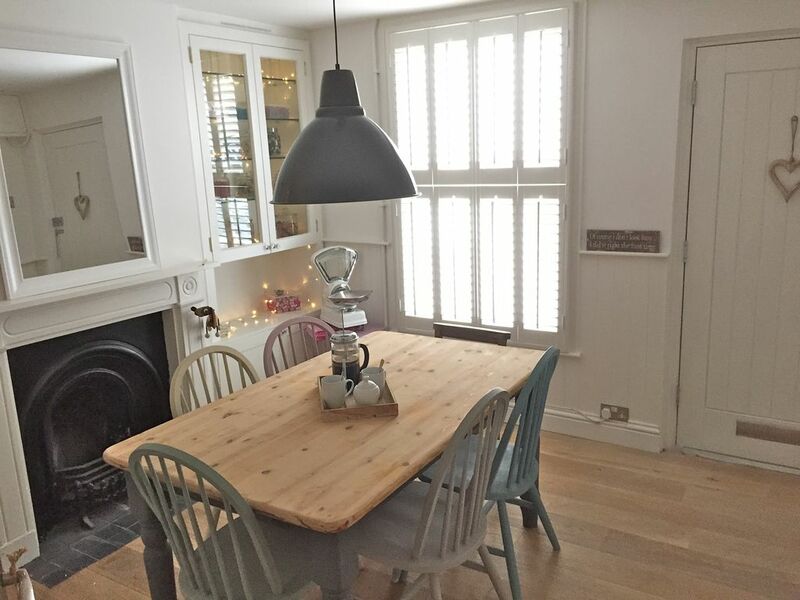 Sherbet Cottage is a newly renovated fisherman's cottage located just metres from Whitstable's famous harbour, pebble beaches and independent shops and boutiques. With all of the comforts of your home, but by the sea. Sherbet Cottage is a well equipped and beautifully presented cottage with the added bonus of it's own parking space to the rear of the property. The cottage is beautifully decorated in neutral tones sympathetic to the coastal surroundings. My Husband and I have lived in Bromley, South London for 15 years. We have a 9 year old daughter and 6 year old son. We fell in love Whitstable after staying in this beautiful coastal town during 2013. We enjoy wandering through the quaint high street, with it's independent shops and fantastic restaurants. We bought Sherbet Cottage in 2013. The location of the cottage is perfect, 2 minutes walk to the harbour, beach and high street. With it's own parking space at the cottage, this relieves any parking stress during high season. A neutrally decorated family bathroom is located on the ground floor with Bath, Shower, Sink and WC. Sherbet Cottage's living area includes 2 Comfy Sofas and an original antique leather Club Chair. A real wood burning stove. A Samsung 32inch Smart TV with Freesat, Apple TV and Netflix access, Bluetooth CD/Radio, Wireless Broadband Internet. Outside: Sherbet Cottage has a well proportioned south facing garden area laid with Shingle/Pebbles and boasting low level, well maintained plant borders. Space includes outside table and chairs, deck chairs and Smokey Joe Weber BBQ Grill. Cleaning / Towels / Linen / Maid service: Bed linen and Towels included. We had a great stay at Sherbert Cottage. We were travelling as a family of four with a two year old and six year old. Our two year old is in a full size cot at home and we were really pleased to find the option a full size cot at Sherbert Cottage. Everyone got a good nights sleep. Would definitely recommend. Was a lovely place to stay with friends. Sherbert Cottage is very ideal for a get away weekend with friends. It's in the best location: right next to Harbour Street where there are all the cute little shops, restaurants, and only two minutes from some lively pubs and the sea. We really enjoyed the coziness, the fireplace and the underfloor heating in the bathroom (what!?). The bedrooms were beautiful and the garden is ideal for having breakfast outside in the sun. Overall, we had most relaxing weekend in Whitstable and it would not have been possible without Sherbet Cottage. Nice location - a good time was had by all despite the weather! Best rental I’ve stayed in! Absolutely beautifully finished property, with everything you could wish for provided. From the bed linen to the toaster, everything was amazingly high quality for a holiday home. We loved the log burner and sweet shop - the kids were in heaven! Thanks for a wonderful stay. Quite simply, Whitstable is unlike any other town you will visit by the sea and it manages to offer something for everyone. It is best known for its native oysters and its annual Whitstable Oyster Festival but it also benefits from a strong arts culture embodied by the numerous independent Whitstable galleries and craft shops and has a rich maritime history. Whitstable boasts spectacular sunsets and miles of beaches and its distinctive character and ambience is all within easy reach of the city (60 miles east of London). As you're by the sea, why not take a beginners course in sailing, windsurfing or kitesurfing? Whitstable has excellent conditions for water sports and Whitstable Yacht Club is a good place to start. If you are looking to buy suitable clothing and accessories for anything and everything marine related, there's no better place to go than the Dinghy Store. Whitstable Marine just next door, can provide everything from kayaks to water-ski equipment. Walking distance to the harbour and beach. Whitstable has a direct fast train service from London which takes just over an hour, there are services from train stations including Victoria and St. Pancras. Travelling to Whitstable by road is also easy with the M2 motorway only moments away from the town.